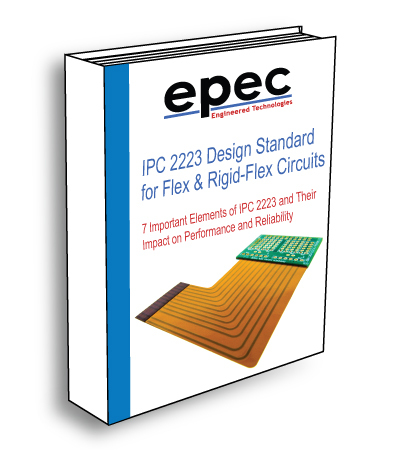 As flex and rigid-flex circuit board technologies continue to advance, it is important to understand some of the more technical aspects when designing your flexible PCBs. The below outlines more of the advanced flex and rigid-flex capabilities for manufacturing higher technology parts. As flex circuit design and components become more complicated with increasing signal switching speeds, it becomes necessary to slow certain circuits down, allowing specific functions of components to perform before others. The increase in processor clock speed and component switching speed on modern flex circuit means that the interconnecting paths (traces) need to be considered transmission lines instead of simple interconnections. With today's higher speed requirements, controlled impedance traces are designed to minimize electrical reflections and ensure an error free transition between the track and interconnections. Flexible are rigid flex circuits are ideally suited for providing interconnections that are specifically designed to provide desired levels of signal integrity using “stripline” or “microstrip” techniques. Laser hole drilling of vias, micro holes, pinholes, nozzles, orifices, and slots with dimensional and positional tolerances of 5 um or better can be achieved. Laser drilling processes utilize various wavelengths including ultraviolet (UV), CO2, or hybrid (both UV and CO2) depending on the hole diameter and material selection. The advantages of the combined UV and CO2 laser system are directly related to PCB (printed circuit board) processing. The UV laser is ideally suited for fast and efficient drilling of copper layers whereas the CO2 laser is uniquely suited for the acrylic layer of the PCB. In combination, the UV/CO2 provides a one-time setup for drilling through flexible and rigid flex PCBs. Best in class laser equipment with extremely precise depth control to accurately cut the underlying substrate of a flex circuit. Precise laser beams can skive (cut off in thin layers) circuit openings with the utmost precision. Sculptured flex circuits are unique in the ways the copper conductors vary in depth and thickness in different places. The copper is thin at the most flexible part of the circuit and thick at the interconnection point. Sculptured flex circuits allow for bare metal connections (like a plug in) and remain strong at the solder joint formation. Sculptured fingers provide a more reliable alternative to mechanically fastened crimp pins. This allows the circuit to have a thicker copper trace in the areas that require a higher structural strength or where the current is strongest. The thinner parts of the trace help the circuit maintain its flexibility. One other common use of the sculptured flex circuit is that its built-in contacts eliminate the need for additional connectors. This can happen when we create bare/exposed metal contacts beyond or in between the polyimide. The method involves selective 3D etching and plating where you are adding for copper to these selected area’s and then removing the polyimide material around it to have the copper exposed 360 degrees. Shielding is applied when a flex or rigid-flex printed circuit board application requires limits in electromagnetic and/or electrostatic interference. Protective shielding can be patterned or solid copper or conductive silver ink. Shielding can be different materials based upon the application but the shielding needs to be conductive and must be grounded. The shielding will depend upon the amount of EMI interference in the device, the conductivity requirements and the amount of flexing that the circuit will endure. With ever-increasing wireless communication networks in the form of cellular phones, EMI is generated from many different sources even outside of the device and should be considered with critical flex and rigid flex designs. See our blog post Flex PCB Emi Shielding Methods and Materials that talks more about this specific functionality. Ultrasonic welding is a technique utilizing high frequency ultrasonic acoustic vibrations to weld objects together. With ultrasonic welding, there are no connective bolts, nails, soldering materials, or adhesives necessary to bind the materials together so that flexible printed circuits can be combined with diverse materials and substances. With the pre-assembly of various application-specific adhesive systems, the flexible circuit board can be easily and permanently bonded with many different materials. Desired stiffening effects can be realized by using backplates made of plastic or aluminum as when they are bonded to the FPC the provide protection of electronic components or to help dissipate heat. Using this technique, we can also encapsulate the flexible PCB to guarantee certain IP ratings of customer devices. Graphic Overlays can be placed over flex circuits, and are typically are used in conjunction with LEDs, LCD displays, or dome switches mounted on the circuits. When it comes to assembling flex circuits, we have the capability to provide very specific services for connectors and pin assemblies based on the design. While we do not provide full SMT services we do provide flexible PCBs with Zero Insertion Force (ZIF) connectors, mechanical crimp on connectors, Z-axis connectors, and both through hole and surface mount connectors (typically circular, D-sub, pin and socket). Eccobond is a two-part epoxy coating that is applied to rigid flex and stiffener flex interfaces to provide strain relief. The most vulnerable place on a rigid flex pcb is the area where a rigid PCB or a stiffener come together as at that point the flexible PCB can be bent past the 90-degree mark which can break the circuitry and cause an open. Eccobond is most effective when bonding dissimilar substrates (FR4/Polyimide), as it was designed for use where shock and peel resistance are desired. It is available in various degrees of hardness formulations, colored either black or clear, and is applied using a fillet technique with specialized dispensing equipment. See our blog post The Use of Strain Relief with Rigid-Flex Printed Circuit Boards for more information.